The First MasterCraft Ever produced in 1968. It was repurchased by MasterCraft several years ago and restored. The First MasterCraft (pictured above), only 12 boats produced in 1968. 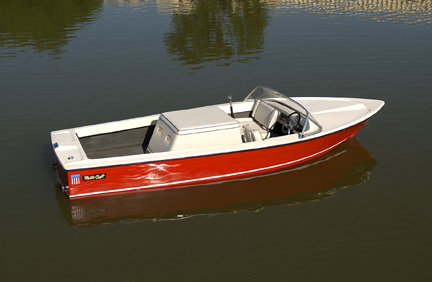 MasterCraft was First hand-laid fiberglass ski boat for better strength and consistency. MasterCraft pulls new World Record in Men's Slalom and Tricks. First Marine Grade carpet for longer wear. MasterCraft pioneers the swim platform to make entry and exit of the boat easier. MasterCraft pulls first World Championship. MasterCraft first uses tracking fins for better directional control in a slalom course. MasterCraft uses first molded instrument panel for increased durability. MasterCraft pulls a new men's Slalom Waterski World Record. Mastercraft introduces the PowerSlot gear reduction transmission for better hole shot and ability to maintain speed under load. MasterCraft pulls new world records in women's slalom and men;s slalom and tricks. MasterCraft is chosen as the official towboat of Cypress Gardens and Marine World. First 100% fiberglass stringers and structural construction for greater durability. MasterCraft pulls new world records in women's tricks, men's slalom and freestyle. MasterCraft pulls Mike Hazelwood to a 203' World Record in Jump. MasterCraft pulls new world records in women's slalom and tricks and sets the women's world record in jump three times. MasterCraft introduces the MariStar, first in a line of large luxury ski boats. MasterCraft's WearGuard pylon reduces rope wear and makes waterski runs smoother by eliminating ratcheting. MasterCraft Pulls Sammy Duvall to a 220 foot World Record in men's Jump. MasterCraft's new ProStar 205 becomes the first open bow boat to gain AWSA approval to pull World Record Capable tournaments. LT-1 Corvette engine becomes the first fuel injected engine in the entire marine industry! First standard equipment electronic fuel injected engine in the marine industry. MasterCraft introduces the MariStar 200 VRS. MasterCraft's new ProStar 190 reduces spray and improves slalom waterskiing. Perfect Pass Cruise control becomes an option. MasterCraft introduces a new roomier ProStar 205. MasterCraft introduces the first X-Star and pulls the first X-Games Wakeboard event. MasterCraft introduces new versions of the MariStar 200 VRS and 225 VRS that set new standads for V-Drive Boats. New Monocoque fitted composite stringer system brings aerospace technology to ski boats. New ProStar 190 hull dramatically lowers spray and improves tracking. New MasterCraft Oscillation Dampening System (M.O.D.S.) uses aerospace materials and a unique structural configuration to dramatically reduce vibration and noise. Advanced fuel delivery system, the industry's only tapered bottom fuel cell with an in-tank fuel pump for improved performance and increase in usable fuel. MasterCraft introduces the LTR engine with 330 HP and the Cadilliac NorthStar System. Parks Bonifay is the first rider in history to land a 1080 behind his MasterCraft X-Star. Teak swim-platform transom protector guards the boat from accidental scratches by skis and wakeboards. MasterCraft introduces a re-designed ProStar 190 EVO hull, which lowers and softens the slalom wake. MasterCraft introduces the X-10 and X-30, wakeboard versions of the MariStar 210 &230. MasterCraft introduces the ProStar 209 and X-9 to replace the ProStar 205 direct drive. The Triple KGB System utilized two rear automatic fill tanks located on either side of the engine and a Fat Sac in the ski locker that team up to provide a total of over 800 lbs. of ballast. The MasterView driver's seat is a flip-up/flip-down driver's seat. It raises the driver six inches higher than normal to allow for a clear, unobstructed view fore and aft. MasterCraft introduces the ProStar 197 and wins Powerboat Magazines Outstanding Towboat Performance Award. Barefooter Keith St. Onge breaks the world barefoot trick record behind a ProStar 197. MasterCraft introduces the new 350 HP MCX Engine. MasterCraft X-Star wins Wakeworld.com Wakeboard Boat of the Year for the second year in a row. MasterCraft introduces throttle by wire on the MCX engine. JL Audio Speakers, Amp. 's, and Sub. 's move the audio experience to a new level. MasterCraft introduces the twin engine X-80/MariStar 280 STS. MasterCraft X-Star wins Wakeworld.com Wakeboard Boat of the Year for the third year in a row. MasterCraft X-Star wins Wakeworld.com Wakeboard Boat of the Year for the fourth year in a row. MasterCraft pulls the US Open of Waterskiing at Downtown Disney. Danny Harf and Rusty Malinoski land 1080's behind Rusty's X-Star. As of 11/21/06 there have only been three documented 1080's and all were landed behind MasterCraft X-Star's. MasterCraft ProStar 197 pulls new world records in Men's Slalom and Jump and again holds the World Record Trifecta (Men's slalom, trick, and jump). MasterCraft X-Star wins Wakeworld.com "Wakeboard Boat of the Year" for fifth straight year. MasterCraft sponsors the U.S. Open of Waterskiing, the event is bigger than ever!